One of the difficulties of working in an inter-, multi-, or intra-disciplinary research group is finding the right place to publish your work. 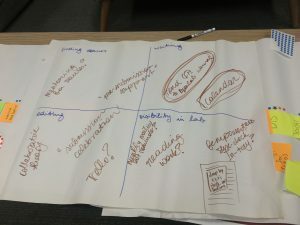 To begin to talk about this, the third of our writing bootcamps was dedicated to thinking about venues and trying to figure out how we can support one another in writing for diverse HCI venues and venues that are not in HCI at all. To kick off the discussion, we individually came up with the names of some venues that we would like to write for – one per post-it note. After a few minutes of silent independent work, we came back together and began to stick down one note after another. Once we had done this, we each picked up a sheet of stickers and started to place one sticker next to the venue that we were also interested in. This process resulted in a long list of venues that we continued to add to throughout our discussions. The unfinished list is now hung up on the wall in the design space with a note asking people to keep adding to it with the provided sticky-notes and stickers. Hopefully others will engage with the wall-hanging so we can grow the list and continue to build a bank of potential venues. Placing the stickers will hopefully help us see how many others are interested in the venue. Moving on from this listing exercise, we moved on to discuss some ways in which we could support one another in writing for these diverse venues. 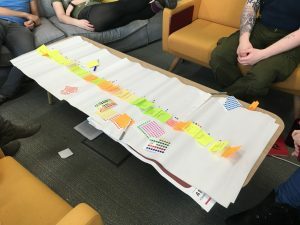 We came up with a number of different ideas, but ultimately wanted to come up with some easy things that would help us facilitate support in the lab more widely. To end the session, we came up with three tangible things we would do to support one another through this process. Of course, these will not solve all our problems, but hopefully they help us build an infrastructure of support that facilitates more interaction which hopefully result in more informal peer support. Send around calls for papers more regularly when we see them via e-mail not only through our fempower.tech mailing list, but also through the openlab-internal mailing list. We said we should also respond to these emails and/or engage with others who are aware of venues we are interested in. We thought of having a tangible calendar for fempower.tech members and others in the lab to add deadlines for conferences and/or calls for special issues. On top of the tangible calendar, we will also look into the potential for an online shared calendar people can subscribe to for deadlines. Of course, we also hope that people continue to interact with the femower.tech station. The shelf has pins and pin boards for people to place calls for papers, information, etc.